“Ludovico Sella raccontò di averne viste in vendita, e a lui giovanetto proposte da un cartolaio di Messina addirittura durante gli anni cinquanta”1“Ludovico Sella claimed to have seen some on sale, and a shopkeeper in Messina offered to sell him some when he was a young man in the 1950s.” Italo Zannier, Wilhelm von Gloeden, Fotografie, Nudi, Paesaggi, Scene di Genere, Alinari, Firenze 2008, p.17. 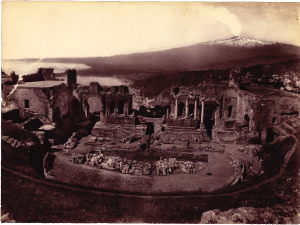 Wilhelm von Gloeden, Greek Theatre, Taormina, 1910 ca. These pictures, preserved in his personal archive before being transferred to the Historical Archives of the European Union, were probably acquired from an antiques dealer. Ortoli, a lover of photography, certainly understood their artistic and technical value. The subjects of these images, responding to von Gloeden’s taste for the veduta style, are the archetypes of Sicilian photography: landscape, archaeology, the depiction of local costumes. This is what Hans Magnus Enzensberger defines as the fundamental elements of odeporic literature, in which the travel experience takes place in a prevailingly temporal dimension, and the idealised past is continuously recalled, as in the traditional narrative of foreign travellers in Sicily.2Attilio Brilli, Il grande Racconto del Viaggio in Italia, Il Mulino, Bologna 2014, p.320. “un singolare ed evocativo viaggio fotografico, che può essere considerato – a “ben vedere e saper leggere” tra le ermetiche, ambigue righe delle immagini – un autentico brano di storia sociale, non soltanto di fantastoria, di quella lontana ma ancora intoccata Sicilia Orientale”3“a unique and evocative photographic journey, which, when properly read and understood, can be considered not simply fantastical, but an authentic piece of social history of that distant and still unspoiled eastern Sicily.” Italo Zannier, Wilhelm von Gloeden, Fotografie, Nudi, Paesaggi, Scene di Genere, Alinari, Firenze 2008, p.10. François-Xavier seems to have decided to articulate his own experience of 1950s Sicily around the images of this great German photographer: an experience framed within the formal archetypes of the Italian journey, shown in the lyricism of the images, in their pictorial value, in its aesthetic which harks back to a bygone era, and the poverty and the social underdevelopment which inevitably emerge. 1. ￪ “Ludovico Sella claimed to have seen some on sale, and a shopkeeper in Messina offered to sell him some when he was a young man in the 1950s.” Italo Zannier, Wilhelm von Gloeden, Fotografie, Nudi, Paesaggi, Scene di Genere, Alinari, Firenze 2008, p.17. 3. ￪ “a unique and evocative photographic journey, which, when properly read and understood, can be considered not simply fantastical, but an authentic piece of social history of that distant and still unspoiled eastern Sicily.” Italo Zannier, Wilhelm von Gloeden, Fotografie, Nudi, Paesaggi, Scene di Genere, Alinari, Firenze 2008, p.10.